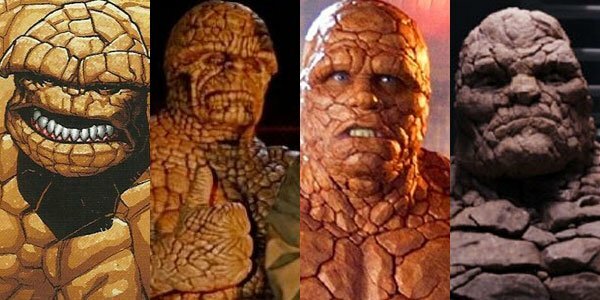 There are many things wrong with Josh Trank's Fantastic Four (almost all contained in the last half of the film), but one thing that the production definitely got right was the look of Ben Grimm a.k.a. The Thing. Created with performance capture, the more monstrous member of the titular team looked more authentic than any previous live-action, and also a solid straight adaptation from the comics. It turns out, however, that there were many designs for the character in pre-production that looked considerably different. Artist Zachary Berger has posted on his personal website a series of concept pieces that he drew for this summer's version of Fantastic Four, and while there are designs that look pretty close to what's featured in the film, there are also some parts that reinterpret the classic look of The Thing. Simpler versions, for example, make him look like how he's drawn in Marvel Comics, but with the added detail of what look like burns (perhaps caused by the experience on Planet Zero). As for the more radical designs, one can understand why Josh Trank and 20th Century Fox steered away from that direction. Some of Berger's pieces look like they are at least partially inspired by the Hunchback of Notre Dame, as he notably has a giant bulge on his left shoulder causing him to hunch over. Also, one of his eyes is completely covered by a drooping rock eyelid, one of his arms is considerably larger than the other, and his feet are absolutely massive. It's clear that the artist was trying to accentuate the deformed part of The Thing character - which is admittedly a significant part of his bio - though it takes the idea a little too far. The difference is The Thing looking like he's covered with a thin layer of rubber that kind of looks like rocks, and actually making him look like he is made out of rock. It's a solid version of the character. The Blu-ray for Fantastic Four will be released on December 15th - and it will be interesting to see exactly how deep the bonus features go into the troubled making of the movie (my guess is not at all).